Amy joined Barton Lodge in 2014, having always wanted to work with animals since leaving school. She has a variety of cats and dogs and also owns two horses. 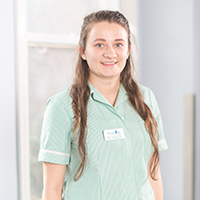 Amy is currently in her first year of study to becoming a qualified veterinary nurse and thoroughly enjoys applying the theory she learns in practice.